No zinc, titanium, nano particles or parabins. Perfect under makeup for an easy-wear grease free feeling, this SPF 50 sunscreen has been formulated for high level protection for everyday use. Ideal for the active sportsperson with 3 hours of water resistance coverage, its easily applied without mess and leave a light, moisturising feeling on the skin. Suitable for all skin types and ages, it provides more than 30 times normal sunscreen protection with an Australian-made, PABA free formulation. Aloe vera heals, smoothes and moisturises while Vitamin E offers antioxidant protection from the damaging effects of solar-induced free radicals and erythema. The addition of natural tapioca starch creates the formulation’s dry-touch finish. Because if sunscreen feels good, you’ll want to protect your skin by wearing it more often. And there’s one thing better than having a good plastic surgeon to remove your skin cancers…not developing skin cancer at all! 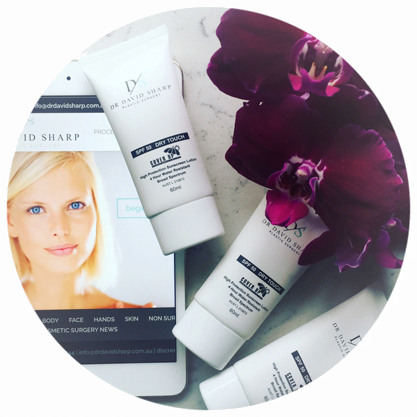 Formulated by Dr Sharp and dermal clinician Deborah Seib-Daniell, this special range of skin care products is born from a combined 35 year’s experience in skin healing, optimisation and prevention. Dr Sharp’s SPF50 Drytouch Sunscreen is priced at $19. WHAT INGREDIENTS PROTECT + NOURISH THE SKIN?